Keeping dogs in a regular grooming routine is part of keeping them healthy and happy. Each breed and dog is unique in its specific grooming needs. Hair length, regularity of grooming, temperament, and experience of groomer act as factors in a healthy grooming experience. For short haired dogs, a sufficient groom could simply mean cleaning the ears, brushing and bathing the coat, clippings the nails, and brushing their teeth typically every 2-4 months. Long haired dogs, however, need more frequent and skilled grooming. Keeping their coat clean and manageable is important to their health. Dogs that aren’t groomed on a regular schedule can be subject to: matting - which can cause sores and bruising, yeast or skin problems, and other underlying issues that routine grooming can help eliminate. Brushing your dog, clipping their nails, and cleaning their ears, in between grooming visits, are all recommended to keep your pup feeling his best. The temperament of your dog can also greatly affect their experience. Grooming can be a stressful time for most dogs, but there are ways you can help your best friend feel more comfortable: Finding a trusted groomer, starting their grooming routine as puppies, and keeping them on a schedule. This can help make the process easier on both you and your pup. Dog owners have a number of choices for regular grooming, including at home grooming and an array of professional grooming options. If you choose to groom your dog yourself, proper research on techniques and tools is imperative. 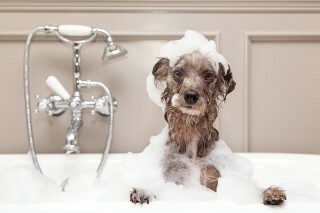 At home grooming is only recommended to those who have done adequate research to prevent accidents and ensure their pet is being groomed safely. For those who would prefer to leave your pet grooming sessions to a professional (which is most people, so don’t worry if this is you!) finding the right groomer for your dog is just as essential as keeping them on a reasonable grooming schedule. You want to make sure the groomer you choose is someone you feel comfortable leaving your dog with. While some groomers offer straight-through service, others will take dogs in the morning and board them until you pick up at the end of the day. Mobile grooming - where a grooming is performed in a van or trailer in your driveway, is also an option for dog owners who require flexibility. For dogs that have high anxiety or whose owners want them to have one-on-one attention, some specialty groomers can offer a calming, spa-like experience. Either way, bringing your dog to a professional can certainly help cut down on the mess in your home. Bringing your pet to a reputable groomer on a regular basis ensures your pet has a handsome look and beneficial experience. Caitlyn Brundage is the owner of Lavish Dog Day Spa.